Starting out: Is it time for nurses to go on strike? For the first time ever nurses are considering the drastic, but arguably vital, step of taking industrial action. It is fair to say that nursing morale is low and public trust in the NHS is being chipped away. Every headline in the media seems to be about the problems faced by the NHS, with too few beds and nurses, and too little money. With one in nine nursing posts unfilled, a pay freeze will discourage people from applying for these jobs. Fewer nurses means that those already employed are being stretched to breaking point and are at higher risk of making mistakes or becoming burned out. 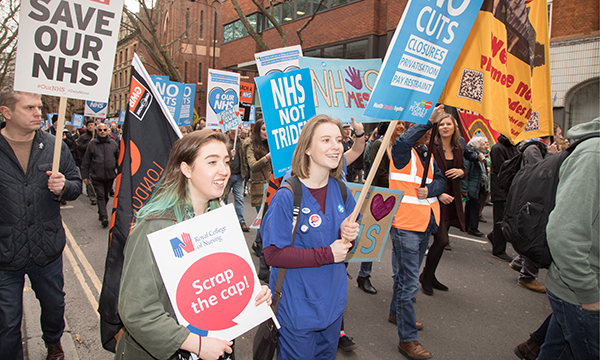 It is hard to gauge what the public’s reaction will be to nurses’ industrial action. Initially, there seemed to be widespread support for the junior doctors’ strike, but would the same be true of a nursing strike? I believe the image the general population has of a nurse is someone kind and caring, but slightly subservient. The battle to be seen as autonomous practitioners is ongoing, but has been slowed by the advent of nursing associates, which moves nursing away from a degree-only profession. Every day, nurses are put in positions where they cannot do their jobs safely and effectively. This could involve working on wards where staffing levels are dangerously low or taking on an unsafe amount of extra shifts to pay the bills. Neither Theresa May nor Jeremy Hunt have spoken out about the proposed strike and I think this demonstrates yet again that the government doesn’t care about nurses and, by extension, the NHS. No one cares more about the NHS than the people who work in it and to force us to strike simply to be heard is despicable.